The Tweed Run is the most coveted and highly anticipated annual cycle ride in the UK. 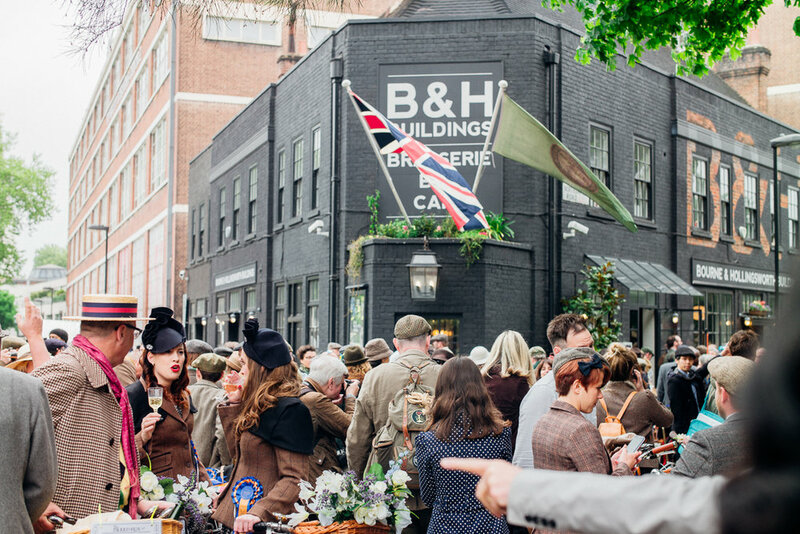 A one of a kind event where participants don their finest tweeds and brogues and cycle through London, stopping along the way to take tea, have a picnic and ending with an old fashioned knees-up in the afternoon. The next London Tweed Run will take place on Saturday 4th May 2019 and tickets will go on sale at 12 noon on Friday 1st March 2019 via the link below. The gathering at the start of the ride is a fun part of the day. Participants assemble in a beautiful square or park in London. 2017’s ride started at Bourne & Hollingsworth Buildings, opposite Spa Fields, where there was also a special participants only pre-ride brunch. Previous starting points have included Trafalgar Square, Somerset House, Covent Garden, St Paul’s Cathedral and the square in front of the Royal College of Art. As riders begin to arrive, excitement builds. There is entertainment provided, and breakfast sandwiches, and tea and coffee are on offer. At the starting time there is a short encouragement from a bugler and a wave of the Tweed Run flag sets us off onto the streets of London. The Tweed Run is a very special event to witness. Imagine 750-1000 cyclists, immaculately clad in tweed, descending on Regent Street. It’s a spectacle so out of the ordinary and exceptional that crowds always form along the route. Shoppers and retailers line the streets, and locals and tourists alike excitedly snap photos and viral videos as a sea of tweed rolls down the major thoroughfares of London. The public can follow our progress via our Facebook, Twitter and Instagram feeds. At about one third of the way through the ride, we stop for a quick cuppa. The location for the tea break is not announced to the public, as it is for riders only. It is a quick and refreshing pause akin to those once found in country sportive cycle races of the 1930s and 1940s. First trialled at the 2013 event, the Tweed Run Picnic Stop was an instant success. Imagine a picnic, concert and village fete all rolled into one. We stop for 90 minutes, and participants are welcome to bring their own picnics or enjoy the food on offer at the stop. Entertainment is laid on by various sponsors, and it’s a lovely opportunity to mingle with your fellow riders. The ride finishes off at a beautiful park, where we offer participants a cocktail and a bit of a knees up at The Closing Ceremony.